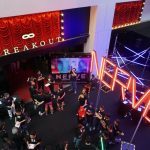 In collaboration with NERVE, Breakout and TGV Pictures Malaysia bring you a reality challenge to test your nerve on the 6th Aug at BREAKOUT NU Sentral. Selected teams will need to go through an extreme brain and physical challenge to win prizes worth more than RM10,000 including cash! · Puzzle solving – hints will be allocated at Level 4 & 5 of the mall. Participants have to go around to search for hints. · 6 fastest team will be qualified to stage 2 and 3. · Watchers will be stationed outside of the game room, Players will be inside of the game room. · Player is required to solve one puzzle and give the answer to their watcher through the CCTV. · If the correct answer is given, Watcher will be given a key to free the Player in the room. · Once the team completed Stage 2, they proceed to Stage 3. · They will have to complete a series of workout instructed by Celebrity Fitness instructor. 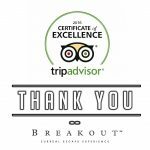 · The fastest team to complete the workout will win the Grand Prize.